As Artists we should be constantly thinking of new ways to earn a living from our craft, so we don’t have to sadly end up back in the 9-5 Rat Race. Sometimes this can be at the expense of our career and eventually the end of it. (See Steve Pavlina). So in a bid to learn new tools and ways to make a living when not working, I went on a ‘How To Teach’ Drama Workshop, by Bryony Roberts (Old Vic New Voices) at IdeasTap this week. I’ve always shied away from the teaching route, my ignorance as a youngster was such that I believed teaching was what failed Actors did. I was naive to how the acting industry actually works and at the time had very few bills to pay – I’m wiser now! I must be frank, my degree is not in Drama and I have no PGCE. BUT I have been a professional Actor for over 10 years. I have a degree, which shows I am able to understand advanced education and I have been part of Theatre In Education, been part of workshops and classes – so why the hell not? 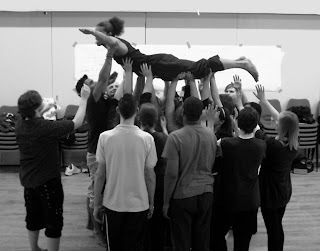 The following information is by no means an exhaustive list of how to take a drama workshop or what to expect, but for me and now hopefully for you it is a jump start into where to look for further advice, training and opportunities. This information was aimed at teaching Secondary School aged children, but can be a reference for all ages. All of the credit goes to Bryony Roberts and the Ideas Tap course. For as long as it takes. It’s worth it in the end. They will ALWAYS be louder than you! Decide a word with class that means stop what you’re doing I want to move on e.g. Freeze & give them a countdown before the stop eg. 1min left – 30 seconds. Set up your rules with the class early. Be clear on 3 rules that you insist on e.g. Hands up, only 1 voice at a time, ‘stop’ word. Longer projects can be more detailed. Homework expectations should be announced early and WHY. WHAT do you expect them to do? / HOW should they do it/ WHY are they doing it? (The most important one – for them to engage they must know why! Pace NOT speeds but using rhythm and tempo. Your workshop should have shape and be a journey for the students. Quiet time can be as useful as busy time. You are the teacher. Be friendly but you are not their friend, you have a responsibility and ultimately authority if needed. Use words like “would you” not “could you”. The key to keeping students engaged is a variety of activities – offer them a varied approach to your theme/topic/source material e.g. Activities, groups, short sharp exercises, longer exercises and discussions. Make it new/ make it up! Drama in schools is (generally) the same activities over and over again as teachers have to tick off the curriculum. As a visiting workshop leader or out of school club – give them something different! Think creatively. NO FREEZE FRAMES! Use task cards and active entrances. You should always be in control of the groupings. Try to think of imaginative ways to organise students into pairs/3’s/4’s which mean they work with different peers throughout. E.g. everybody wearing . . . Mix years and put youngest in charge as Director etc. If something has engaged them, be flexible with your plan allowing discussion to continue etc. Always get a young person to feed back a complicated instruction, they will usually articulate it better than you and will communicate it in an understandable way to their peers. If you haven’t caught the students name after they’ve said it twice, wait for someone else to say it and/or use ‘mate’ or something appropriately similar. Use labels. Positive reinforcement is far more effective than telling someone off. Praise good behaviour to make it a sought-after way to behave. Don’t be too smiley! Let them earn your smiles. If you are taking sessions in school discuss expectations with teachers beforehand. They should ALWAYS be in the room (or another supervising member of staff). They should only discipline students if asked. They should take an active interest in the workshop (not marking books), but should only participate if asked. Set up clear boundaries in the first 10 mins of the session (best time to get them). No shouting, no pointing, no threats. Create your own warning system e.g. 3 strikes etc and use it consistently. Remember that it is about the student’s not the student personally. Inappropriate stuff: Get them to verbally explain what they are doing. They usually won’t and nip it in the bud. ZERO TOLERANCE FOR BULLYING. You are older and more experienced worldly – you will be more knowledgeable than them don’t panic. For long term projects, value the ‘unknown’. Never give too much away until at least 3rd week. Respect from students often comes from them not being able to figure you out. Always over-plan to prepare & take account of lulls/dead time. Know what you’re doing thoroughly – don’t just glance at your plan the night before. When you enjoy it – they’ll enjoy it. Need Enhanced CRB check – get in touch with local councils for this. As I said I've never facilitated a workshop alone and this is new to me too but hopefully from here you and I can research further and get out there and work. Good luck!